With the novel H1N1 virus gaining a foothold in the northern hemisphere, anxious doctors, researchers and members of the public are carefully watching its movement and behavior. Even before WHO declared novel H1N1 a pandemic late last spring, Emory University had been readying for its arrival. James Steinberg, MD, chief medical officer at Emory University Hospital Midtown, has been at the forefront of that preparation. "A few years ago a decision was made to fund a center for emergency preparedness and response," says Steinberg. "Having CEPAR, headed by Dr. Alex Isakov, gave us a leg up on preparing for this pandemic. Concern about the avian flu a few years ago sparked a pandemic plan and an antiviral plan. Having those plans on board helped us hit the gate running with the swine flu." 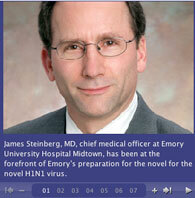 To listen to Steinberg's own words about novel H1N1 and its effect on the current flu season, access Emory's new Sound Science podcast. An expert in infectious disease, Steinberg says three key factors go into the making of a pandemic. "A virus can cause a pandemic when it can cause significant disease, when it's a new virus to which people don't have any immunity, and when the virus has the capacity to spread from person to person," Steinberg says. "The novel H1N1 virus appears to meet all three of these characteristics." Steinberg cautions that the word pandemic has a horrible connotation. "We think of the 1918 pandemic that killed 50 to 100 million people worldwide, more people than were killed during World War I itself," says Steinberg. "But there are pandemics in which the bumps in mortality have been modest." The H1N1 virus spreads from person to person via large droplets, the ones that fall quickly onto surfaces. These viruses can be spread by being close to an infected person who is coughing or sneezing or by touching contaminated surfaces. That's why hand washing reduces the chance of infection. Thus far, the novel strain of H1N1 has been relatively mild. Most of those infected have recovered without hospitalization or medical care, but according to the CDC some groups are at higher risk and should be vaccinated first. These include pregnant women, people who live with or care for children younger than 6 months of age, healthcare and emergency medical services personnel, persons between the ages of 6 months and 24 years, and people ages 25 through 64 who have chronic health conditions. Initial supplies of the nasal mist H1N1 vaccine are expected to be available this week, followed soon by the injectable vaccine. The regular seasonal flu vaccine will not provide protection against the novel H1N1 strain, so people will need both vaccines.